Most westerners know little about the country beyond the atrocities of the Khmer Rouge and the magnicent Angkor temples. For me, the thriving markets and the ingenious re-use of materials are seared into my mind when I think of Cambodia. 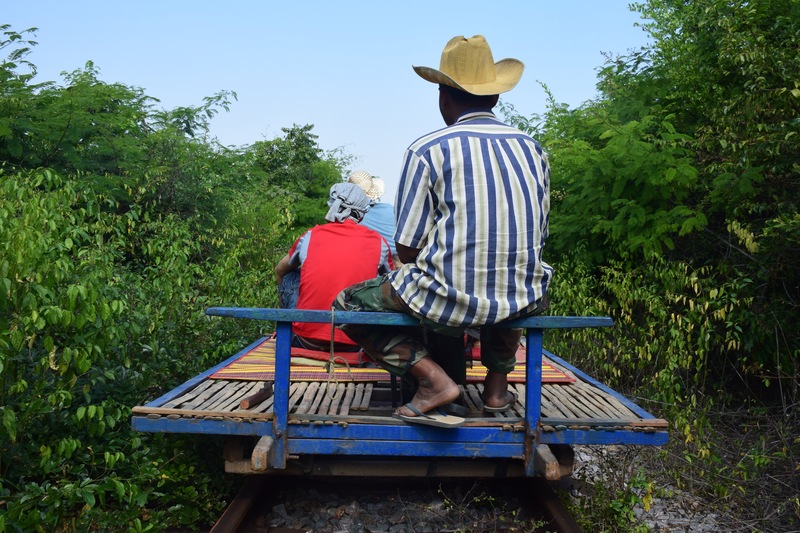 Cambodia’s railway is a causality of the civil war. The tracks are warped and the trains haven’t run in years. So the people built their own. The boogies were originally fashioned out of disused tank parts and is powered by motorcycle engine. Passengers and freight are transported on mat bamboo sticks at over 30km an hour. Kralan is a favourite road side snack. 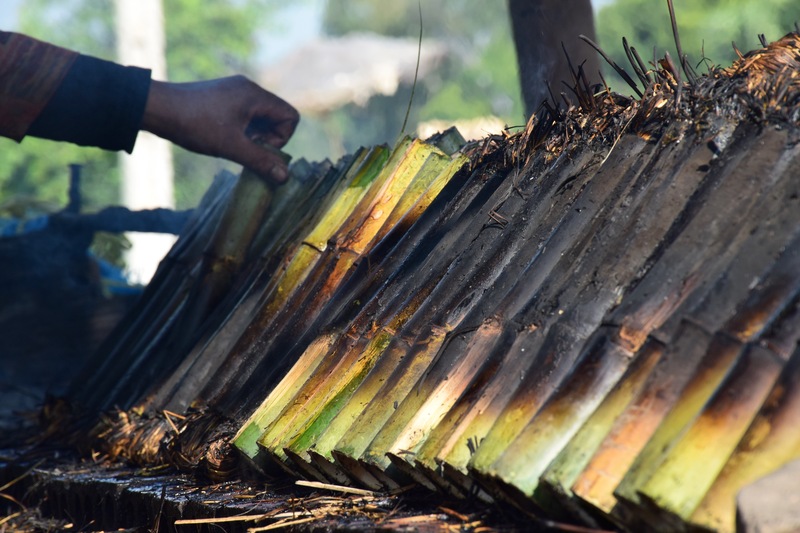 Sticky rice is cooked together with beans and coconut milk inside a section of bamboo over an open fire. It’s a hot and time-consuming process. The results are a highly portable and delicious snack guaranteed not to upset the stomach on long bus rides. Unlike the food I often associate with road trips, there are no artificial chemicals used in the food nor packaging. When I fly back to Singaore on Sunday, I will return to modern conveniences. The footpaths are in pristine condition, my local supermarket stocks food from around the world, I can order food, a taxi or a book straight from my phone. Leaving here I can’t help but be melancholy about the state of education. That ability that is inherent in children to explore, reuse and repurpose items from the environment around them. To build things with their hands is something we are systematically educate out of our children. As kids move through school the building blocks are put away and interaction with environment is limited to the ‘saving the planet’ unit. We live in an age where almost every whim can be satisfied from a screen, any fact looked up and possessions quickly discarded when they are no longer the latest model. How can we expect our kids to want to learn about saving the planet through staring at it from a screen? How can we ask children to reduce, reuse and recycle when it’s easier to go to the store and buy? How can we ask kids to be mindful in their use resources, without taking time to show them how that meal is prepared, where the ingredients come from, how they grow? We can’t ask kids to share the planet if we don’t first show them how it takes care of us? Does Social Media really encourage entitlement? When does crowdsourcing become plagiarism? This is powerful, Stephanie. Not because its sentiments are stated simply but because that simplicity, of actually making the effort to do the obvious – to actually connect our senses physically to the worlds we need to study so that we can care for them – that simplicity subtly sidesteps the technology. This is the beautiful and necessary counter-balance to the deafening drive to improve our skills as teachers with technology. Surely as teachers the one thing we do have is a lush crop of experiences of the real world and that is where our true passion for teaching resides. Mastering the tools of the trade just helps to create a truly valuable product – students who can critically examine and participate in their world. I will keep this at the front of my planning in 2016, particularly as I lead teachers in building their skills with digital tools! Indeed I am techno-gadget person but I am mindful of having a balance. We need to make sure technology enhances what makes us human.